The numerous deadlines, fast-paced and grade-focused educational systems, and high academic standards greatly contribute to the overall development of students. Sleeping, eating, and substance-abuse disorders are common among students. Pressures from school, social, and career aspects become too much to handle. Is this really our goal? To produce student zombies who are chronically stressed and sleep-deprived? In response to these, mindfulness-based interventions have been widely implemented among public schools. Incorporation of meditation practices in the curriculum show positive effects on the students and faculty’s academic and teaching performance, respectively. Such awareness techniques also contribute to lower anxiety and depression among the student population. International organizations and companies also prove the success of meditation in training individuals. Students who have had yoga sessions before exams had significantly higher scores than those who did not incorporate meditation into their weekly schedule. Freeing the mind from other distractions and focusing awareness on the information needed by the current task led to better performances on examinations. Students are not only known for their multi-tasking abilities but their wild disarray of thoughts, as well. Pressure to meet high academic standards may cause students to set unrealistic standards for their academic performance. This may lead to negative evaluations of their scores and accomplishments. Instead of focusing on how well they did on a quiz, they may concentrate on how many mistakes they made. 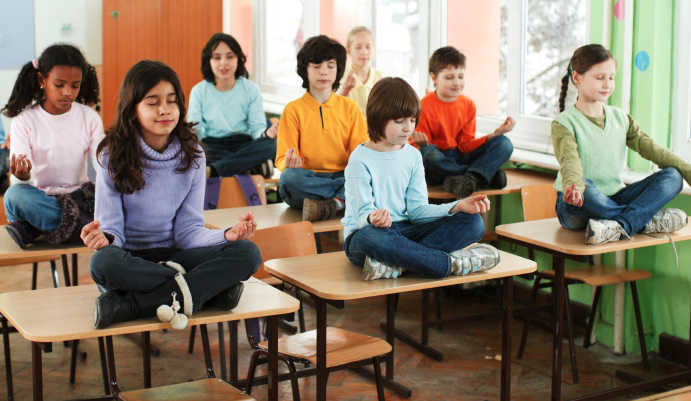 Mindfulness-based interventions encourage students to accept their selves as a whole. It promotes awareness of an individual’s strengths and weaknesses. It disputes the erroneous idea that scores solely define an individual’s intelligence. It focuses on the oneness within an individual, a clear knowledge of his or her limitations and skills. Restlessness is common among students. The nagging urge to be productive leads to higher levels of anxiety. They are pressured into filling their schedule with the completion of requirements and school works. They seldom find time to simply sit still, contemplate, and reflect. Meditation allows the mind to rest and to be fully aware in what is happening in the present. It allows students to let go of the baggage of the past, and the worries of the future. It emphasizes on the strength needed for today. This compartmentalization of tasks and priorities gives students an opportunity to effectively manage their time for school and relationships.